Fire blight canker oozing bacteria from a pear trunk. The Cougar Blight model over at NEWA is predicting a high risk of fire blight in Southern counties for this week, due to the predicted hot weather along with a chance of showers. 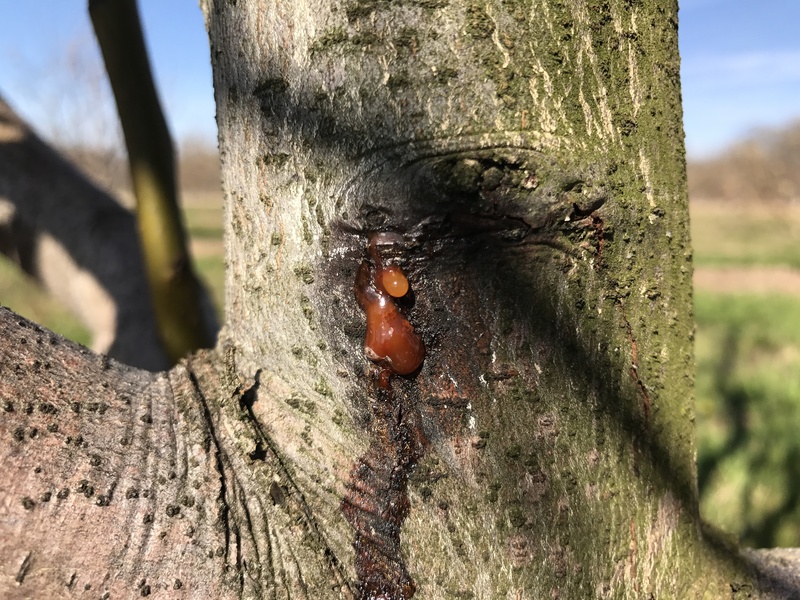 Actively oozing cankers were seen this week in a young block of pears in Gloucester County. Currently April 12-15 looks like a high risk for infection in southern counties. Growers should apply antibiotic to any apple or pear blocks with open blossoms prior to any risk of infection. Streptomycin and oxytetracycline formulations are generally thought to provide 1-2 days protection and possible 24 hours back action. A prediction of high risk over a 4 day period may require 2 applications 2 days apart, especially if there is rainfall, and/or the orchard is not yet at full bloom. Follow the label rates. Streptomycin can be applied at 24 ozs. per acre with the addition of a penetrant such as 8 ozs. Regulaid. Check your local conditions using NEWA and check back daily as the prediction may change. Remember to enter the date you first observed open blossoms. The next wetting period looks to be the first significant ascospore release. At this time powdery mildew and rust diseases are also a concern. Choose materials that have efficacy for all of these diseases. At this time Inspire Super, Vangard, or Fontellis plus a half rate of an EBDC chemistry should cover all the bases. While we suspect there is scab resistance to the older DMI’s (FRAC code 3) such as Rally, the DMI component of Inspire Super may still be very effective, but should be used sparingly. Avoid any of the QoI (FRAC code 11) formulations (Pristine, Sovran, Flint, etc.) for early season scab applications as these are better saved for late primary scab applications and summer diseases. The labels for QoI chemistries are generally limited to 4 applications of a QoI in any combination per season. A biofix has been set for Oriental Fruit Moth. Applications targeting first generation egg hatch should be applied at 170-200 Degree Days after biofix. A second application is recommended at 350 -375 degree days after biofix. This generally corresponds to the petal fall/shuck split timing in peach. No insecticides are needed or should be applied until all the petals are off. Catfacing insects are not an issue at this time as populations are very low and any blossoms that are hit will abort. In southern counties we should reach 170-200 DD around the beginning or middle of next week. (17/P23) TRENTON – With the state expected to experience more freezing temperatures tonight and Thursday night, the Department of Environmental Protection and Department of Agriculture will again allow farmers to do controlled open burning or use specialized torches known as smudge pots to protect flowering crops from damage. The two agencies previously authorized precautionary and voluntary use of smudge pots on March 10 due to below-freezing temperatures forecast through that weekend. Temperatures are expected to drop to the low 20s tonight and Thursday night through most of the state. 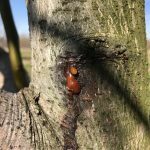 The expected freeze follows unusually warm temperatures in recent weeks that coaxed some economically important fruit tree crops to bud much earlier than normal.